Castle Comfort Stairlifts offers top brand stairlifts, keen prices and fast installs for all those seeking stairlifts in Runcorn, Cheshire. And all work comes with our no-quibble guarantees and famous customer service satisfaction. Give us a call today on 0151 676 2727 If however, you are looking for fascinating facts about the area then feel free to read on. Industrial town and coastal port Runcorn in the north west of Cheshire is our destination today. The captain of the Titanic, Edward Smith bought a retirement home in Runcorn but never lived there as he went down with his ship. If your ‘retirement’ home could benefit from a stair lift, then please get in touch with Castle Comfort Stair Lift’s local office. Their expert advisers can explain the benefits of the various chairs we supply as national agents for all stairlift manufacturers. Take a look at our video first and then give us a call on 0151 676 2727. Runcorn sits on the southern bank of the Mersey opposite Widnes on the northern bank; this is where the Mersey estuary narrows to form the Runcorn Gap. It is just 16 miles to Liverpool going west and 8 miles to Warrington one of our earlier destinations going east. Runcorn was a health resort back in the 18th and early 19th centuries but as the industrial revolution took hold and industries in the area developed, Runcorn took advantage of its location and became a port. Its links to the canal systems that were being built meant Runcorn had access to the sea and to the interior waterway system of the UK for perfect distribution of any products. In the 19th century Runcorn Railway Bridge was built across the Runcorn Gap joining the north and south banks of the Mersey for easier transport. Last century the Silver Jubilee Bridge was built nearby so that in most photos you see both bridges. Runcorn has often been used as a film location, so much so that it has been nicknamed Woollywood; part reference to Hollywood with the Woolly coming from the nickname for the Liverpool dialect, Woolyback and also given to folk from the north bank of the Mersey. Merseybeat a BBC police drama was filmed in Runcorn as was the same network’s situation comedy Two Pints of Lager and a Packet of Crisps about the lives of a group of twenty-somethings. It was written by eighteen year old Susan Nickson for whom Runcorn is hometown. The title comes directly from punk band Splodgenessabounds’ 1980 hit single ‘Two Pints of Lager and a Packet of Crisps Please’. A BBC Three drama, Drop Dead Gorgeous was also set in Runcorn; the title sequences showed shots of the Silver Jubilee Bridge and Halton Castle. If you’re the wrong side of twenty-something and need a little help or if you’re no longer able to ‘walk the beat’ as often as you’d like, why not let Castle Comfort Stair Lifts lend a hand? Our local office can offer all the assistance you need to source the right stairlift for you. If you need assistance to purchase, we can give you information about funding grants or details of 0% finance deals for more instant help. 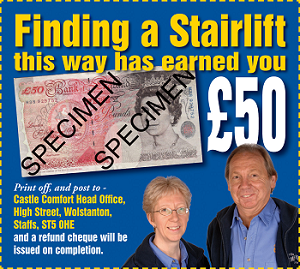 Don’t forget we also offer a part-exchange deal to trade in your old stairlift for a new one and some cash. You can even use our £50 voucher towards it. Give Castle Comfort Stair Lifts a call on 0151 676 2727. Just like Chester, Runcorn is steeped in history. It has 59 listed buildings! Halton Castle dates back to the 12th century probably originally built of timber and then later of local sandstone. It was held by the Royalists in the Civil War. There is a connection to John of Gaunt and his son Henry Bolingbroke, later King Henry IV of England and certainly once he was king, the Castle became part of the Duchy of Lancaster. The Castle is in ruins now but the former Courthouse rebuilt in the 18th century survives as the Castle Hotel. The oldest standing building in Runcorn is Seneschals House in Halton. It was originally built in the 16th century for Judge John King. Only one wing of 15th century Hallwood Mansion also in Halton survives as a public house. Just three miles from Runcorn in the village of Norton is Norton Priory it was a 12th century Augustinian Abbey, now you can see the excavated ruins, a museum, the surrounding gardens as well as the walled garden which was redesigned in the 1980’s. The Georgian Bridgewater House was built in the 18th century near the canal of the same name. In nearby Danesbury you can still see Danesbury Hall built in the 18th century as a former home. This Georgian beauty has three storeys and seven bays; it is now owned by the charity Scope and used as a residential home. Who do we know from Runcorn? Current celebrities Nicola Roberts of Girls Aloud formed after they won Popstars the Rivals in 2002 comes from Runcorn as does comedian John Bishop and a regular visitor to the area is Kym Marsh ex Hear’Say singer – the ‘manufactured’ band won Popstars in 2001 - and Coronation Street star. Gary Barlow of Take That fame was born in nearby Frodsham; he is a Warrington Wolves supporter. Mezzo-soprano Alice Coote also comes from Frodsham. Physicist John Holt was born in Runcorn. He went on to win the Nobel Prize for Physics and to play a part in the development of the atom bomb. 19th century businessman Thomas Hazlehurst also hails from here; a staunch Methodist, he was responsible for building 12 Methodist chapels and 3 schools in the area and carried on the family business Hazlehurst & Sons in chemical manufacturing. OK we’re at the end of our short tour of Runcorn and you know the drill. 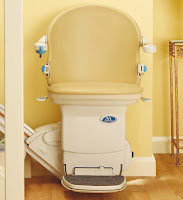 If you are still looking for a stairlift, Castle Comfort Stair Lifts are the people to contact. Our local office will be able to help you with all aspects of sourcing and funding if necessary. Check out our comparisons on our website and then give us a call on 0151 676 2727. Gary Barlow is everywhere ! - he'll be able to have a gold plated stairlift when he retires.